Summary of Bo Forbe's "Yoga for Emotional Balance". Bo is coming to Eyes of the World April 1st. 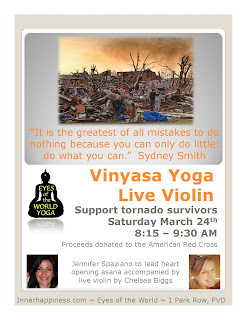 Live Violin Vinyasa Yoga March 24th! You're invited to a live violin yoga class by donation at Eyes of the World - proceeds to benefit the American Red Cross in support of tornado survivors. Spread the love and the good word. Part of the work I'm doing with the Bulter Hospital research study on healthy living and depression, I recently read Bo Forbes' book "Yoga for Emotional Balance." Bo is also coming to Eyes of the World yoga studio in Providence Rhode Island - so reserve your space while they'er still available! Bo Forbes writes eloquently, and convincingly, that yoga can allow for emotional release without talk-therapy processing. In her experience, yoga literally bypassed the need for psychotherapy in some situations and most definitely aided the process. 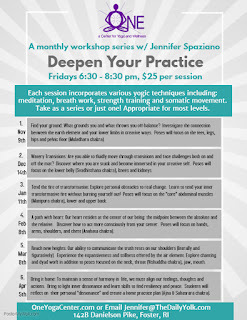 However, while Forbes deeply believes in yoga’s power to heal, she promotes a very non-active practice to allow for this emotional release to occur. This doesn’t mean Forbes denies the benefits of active asana, on the contrary, she also teaches vinyasa classes. But within her therapy sessions, she build a model based in restorative yoga as the pathway to emotional balance and health.